It is 11:30 pm in Japan and I cannot sleep. I’ve tried praying, reading, playing a mindless game, counting to 100 in French, yoga breathing…I really have tried everything but putting on a movie and hoping I don’t get wrapped into it. And now I’m trying to write. While tired and anxious. So this will end well. Many items of varying degree of import are weighing on my mind tonight, and my usual compartmentalization techniques aren’t working to slow down my brain. One of those items weighing on me has been doing so for about two weeks now: my inability to be creative. My niece Chloe is 6, and as such, she is adorable 90% of the time. Chloe loves to be creative. She draws, colors, dances, builds. And she loves to do those things with other people. So when the paper and colored pencils come out, I am never off the hook–I am commanded to create. 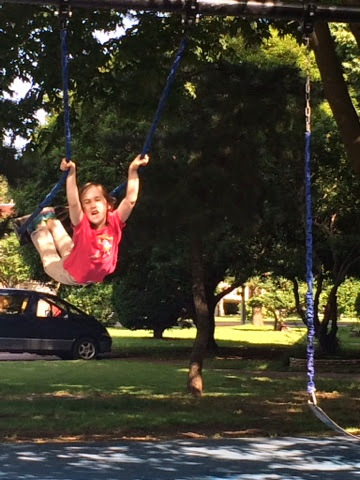 This is Chloe swinging while standing–something I was much too afraid to do as a kid. The problem is, I don’t know how. “I can’t draw,” I respond. “Everyone can draw. Just draw anything,” Chloe says. And I resort to what I know: hearts, trees, grass, flowers, sun. And Chloe draws unicorns with rainbow fur and magical castles and lakes, and she doesn’t think twice. “Build a castle with me,” Chloe says, as she pours out a bin of foam blocks. I sit on the floor, hold two squares in my hand and wonder how to start. Chloe is observant for a six year old, because she starts to direct me. Tells me which order to put the blocks in to make a castle. Five minutes later, we have identical castles on the living room floor. “Now knock yours down and build a new one,” she says. So I knock it down and build a stodgy, symmetrical, no-nonsense ‘castle’ that no princess should want to occupy. Chloe is just like my sister Deanne in a lot of ways–in ways that I envy. When we were little, Deanne was fearless. I often wonder if she looked at my cautious demeanor and decided she didn’t want to miss out on everything I inevitably would. This is part of what freaked me out so much with my first trip into Tokyo–we did not have a plan. And in a city with 80,000 restaurants, Deanne (and frankly, logic) says a lunch spot doesn’t need to be planned out prior to leaving. In a city with 100 train stops, any given stop will yield something interesting. I don’t necessarily want to change my extreme type A mentality, but I do want to find a way to be less scared. Less scared of failing, less scared of creating something subpar, less scared of ducking into a random restaurant and discovering a new favorite. I’ll start small tomorrow–we are hitting up conveyor belt sushi, and I vow to eat something other than California roll. And even after purging all those thoughts, I’m still not entirely sleepy. So I shall fire up a movie and hope it does the trick. ← Previous Post Let Me Share Way Too Much About My Health. Oh, and Sushi, Finally.